No experience is ever wasted! No trial, pain or experience is ever a waste of your time or effort! As we grow in Life it is our experiences that make us who we are. Many a time we are having to involve ourselves in doing things that seemingly have little or no meaning or relevance then. After all pain happens only when something you don’t want presents itself in your Life! So when we endure pain, we wonder why it had to be happening to us in the first place? We therefore resist that ‘uninvited’ experience. Our resistance plunges us into sorrow and depression. But if you look back at your Life so far, all that you have been through is what has made you who you are. Your real education happened in Life, and continues to happen now too, ONLY through the myriad experiences you have had. I learnt this lesson the hard way too. Almost two decades ago, I worked as the Executive Assistant to India’s pioneering telecom entrepreneur. This person prides himself to be the richest Tamilian in the world. I had quit a fairly successful media career to join him as his EA in Singapore. An EA’s role is actually one that involves a lot of planning, strategizing, reporting and number-crunching, while leading projects and, often, crisis management efforts. In the normal course, good EAs, to great Chairmen or organizational leaders, in about a decade, graduate to running those organizations themselves. After all, the EA would have learned so much about leadership and management, at the feet of the leader! I had such a vision for myself as I took up my position at Singapore. I was barely 27 then. But I was in for a shock. The man turned out to be brute at work. He paid me well, no doubt. But flogged me to work for 20 hours a day. I had to travel with him around the world. Living out of a suitcase. He was both impulsive and abusive. So, we would have barely landed in a country, a new city and checked into a hotel. But he would want the next morning’s flight out. He was never organized. And I was just the opposite. I liked, and still do, to have a daily list of tasks, maintain schedules and preferred quiet periods where I could sit and work on minutes of meetings, whet contractual documentation and create value for my boss and our organization. We were at that point working on two projects that would__and eventually did__revolutionize India. One was the introduction of cellular telephony and the other was introduction of Direct To Home TV broadcasting __ both through new legislations in India’s Parliament. My boss was a maverick, deal maker. He was not an institution builder. He liked to get businesses off the ground, often corrupting powers that be in the process, and then sell them to larger business houses for a profit. Initially, I suffered the grueling schedule, the inconsistencies and idiosyncrasies believing it to be a learning experience. Traveling different time zones each week, managing a non-stop 20-hour day, daily, for over 18 months, non-stop, was indeed a learning experience. But slowly I began to hate my work. Because it made no sense to be on tenter-hooks at the time. I lived by the edge literally. I had to always be around my boss. Despite all my preparation, I would fail. Because he had this knack of asking for the one thing I had not thought of or prepared for! He had, in addition to my responsibilities as his EA, also loaded me with responsibilities that normally have to be handled by a personal assistant. So, here I was, in one moment sitting in meetings with satellite manufacturers, or equity funds or global telecom players, and at another moment rushing to get his tickets confirmed or buying him coffee or Aspirin. Since he maintained no laptop, or email or papers himself, I had to make sure our documentation was perfect. And where was the time to do any documentation when you spend 20 hours on your feet each day? My boss invested in stocks heavily across the world. So, he slept for one hour spells during the day or night, depending on which stock market he was tracking that day. But never beyond an hour at a time. That hour, I could not sleep. I used that golden hour of peace and quiet to complete documentation, struggle with sending mails (email was so new at that time: Hotmail was not yet born!) and faxes. And I had no help. I could notice that my efficiency was clearly suffering. I was losing hair and gaining weight. I tried broaching the subject of working in a more organized manner with my boss. But he would only get more abusive. He would shout expletives at me. It was very embarrassing. And it affected my self-esteem gravely. So, I started fearing speaking to him. Soon, I became a robot, just executing orders. Within me, I was grieving though. It was humiliating and frustrating. One day, I walked into a meeting at Singapore, that I had coordinated, at the Ritz Carton Hotel’s Presidential Suite (where my boss was staying). I lived in the mini suite opposite to his. The meeting was between my boss and the Chairman of one of the largest business houses in India. My boss asked me for a set of papers which were not part of the agenda being discussed. In fact, they were completely unconnected with this business group we were meeting. I explained to him that I had had no time to prepare them and intended to get them ready shortly. He shouted at me, in front of our visitors: “Punnakku! Thevidiya Payan. You are both stupid and foolish!” ‘Punnakku’ means ‘cow fodder’ and ‘Thevidiya Payan’ means ‘son of a whore’ in Tamizh. Both the Chairman of the business group visiting us and his CFO, who was part of the meeting too, knew Tamizh very well. I felt like a worm. I quit that day. And took a flight back home. It took two months of sleeping entire days and much caring by my loving wife to recuperate from that traumatic experience. In the months that followed, even as my boss tried making peace with me and tried wooing me back, I wondered what a horrible waste of time this whole stint had been. I did not see any reason why I should have been paid so highly and treated so poorly. I did not understand why despite my integrity and ethics-based value systems I had to go through what I went through. I grieved struggling to make sense of the whole experience. To be sure, at that time, I couldn’t understand it at all. But over the years, with newer experiences coming in my way, I can see how that stint with the man, those 24 months, had prepared me to deal with Life better. and deal with any amount of irrational, unreasonable criticism. 2. The 20-hour work days, not knowing what will hit you from where, have made me prepare meticulously. Sometimes, people around me think I am very paranoid. I am not really paranoid as much as I am usually well prepared. 3. Thegrief and the trauma I went through, when I was socked and beaten up, metaphorically, each day, have made me, despite all my preparation, to accept the bizarre turns Life can take at times. So, nothing really surprises or shocks me anymore! 4. And being his EA and PA have made me, hopefully, a very adept crisis manager. 5. Allthat crazy international travel have made me a road warrior. I can survive in any condition, in any airport, anywhere in the world! And I have learned to love travel and make my hotel rooms my home where I find peace and sleep the moment I hit the pillow! I am claiming all of this with all humility. 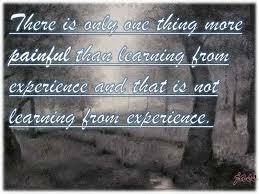 Because I am still learning each day from each new experience. But, without doubt, without that experience I wouldn’t be half as tough a person that I am today. I met my former boss, many years later, in the lobby of the Mumbai Taj, at the Gateway of India. I held his hand and thanked him profusely for the experience. I said, “Without you, I wouldn’t be the AVIS I am today.” He was startled, but gave me a hug and invited me to stay in touch! So, don’t resist what you are going through. Everything happens for a reason. If we knew the reason before hand, we would end up intellectualizing the experience. Like the way we intellectualize our academic syllabi through school or college. Life is a hard teacher, as someone said. Because she always gives the test first and the lesson later. Simply, accept and love whatever you are going through. Because it is preparing you for what you will have to live through! With each new experience, you can only get better with living this Life better! Author AVIS ViswanathanPosted on January 19, 2013 March 14, 2016 Categories Art of Living, DTH, EA, Executive Assistant, http://schemas.google.com/blogger/2008/kind#post, Intelligent Living, Learning, Life, Living, Singapore, Tamilian, Tamizh, Teacher, TelecomLeave a comment on No experience is ever wasted!